This time we’ll be walking the first 38 days of the trail and we’re breaking the route down into THREE parts: PART 1 and 2 of 12 days each and PART 3 of 14 days. The first part is from Ras Shetan on the Gulf of Aqaba coast to Ein Kidd where there is a beautiful oasis with palms and bamboo. This first section of the route will be guided by the Tarabin and Muzeina tribes. On the second part the route continues from Ein Kidd to the highlands of St. Katherine. You will walk through narrow wadis, cross high passes and climb some of the highest peaks in Egypt with the Awlad Said and Jebeleya tribe. 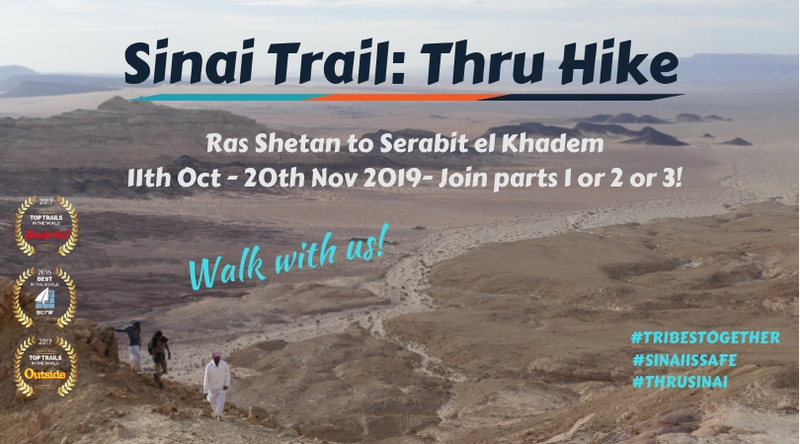 The third part runs from St. Katherine to Serabit el Khadem via some of the Sinai’s most remote wadis and mountains, with the Jebeleya, Awlad Said, Gararsha, Hamada, Sowalha and Alegat tribe. You can join PART 1, PART 2, PART 3 or PARTS together.